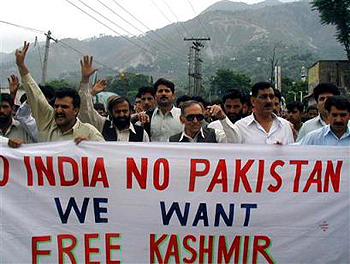 Supporters of the Jammu Kashmir Liberation Front stage a rally demanding freedom of Kashmir near Muzaffarabad, capital of Pakistani Kashmir, on April 7, 2004. Though voices of separatism and autonomy are not new in India, the problem of a Kashmiri separatist movement is the most complex political problem to date. Notwithstanding that India considers Kashmir as its integral part, secessionist powers in Kashmir don't accept this claim. These separatists enjoy complete moral and political support from across the border in Pakistan. It has become an internal compulsion of Pak rulers to instigate and support the separatist movements on the Indian side of Kashmir. In retrospect, the Indian role in the creation of Bangladesh by partitioning Pakistan in 1971 is clearly visible. Aggrieved by the events of 1971, Pakistani Army officers and leaders are certainly using the Kashmir problem as a tool of revenge for that insult. Pakistan's action cannot be tolerated anymore, and separatists cannot be given more freedom to play into the hands of Pakistan and poison the valley. Do common Kashmiris really want freedom? We need to explore the detailed definition of freedom of Kashmir—whether separatists are asking only for independence of the Indian part or are imagining a big Kashmir including the Pakistan-occupied Kashmir. China-occupied Kashmir also needs to be taken into account. The majority of pro-Indian voices cannot be overshadowed by the fear of a few secessionists and their propaganda to mislead Kashmiri youth against India in the name of religion. There are many such issues that are complicated yet essential and need to be resolved to find a sustainable solution for Kashmir. Violence under the banner of the separatist movement has been taking place the last three decades. Separatists, terrorists boasting of Kashmiri culture and Kashmiriyat, have forced hundreds of thousands of Kashmiris to leave their homes in the valley. Kashmiris, the majority of whom are non-Muslims, are forced to live the lives of refugees in their own country. One thing is clear by such inhuman activities: These separatists don't care about Kashmiriyat or Kashmiri culture. They are just instigating violence in the name of religion. And those Kashmiri moderate Muslims, who do not support their so-called freedom movement, are either killed by them or are forced to leave the valley. Thus, the question arises as to whether these numbered separatists want an Islamic country in the form of "Aazaad Kashmir" (Independent Kashmir). This is clearly visible by the ongoing movements, protests, rallies and venomous speeches in Pakistan-occupied Kashmir and Pakistan vis-à-vis Indian Kashmir. Supporting the stand of separatists, once again Pakistan has requested the U.S. president to hand over Kashmir to the United Nations. This has come at a time when Obama is visiting India. Pakistan is trying to prove to the United States that Kashmir, contrary to the claims of India, is not an integral part of India, rather a disputed territory. Many important questions can be put to those few secessionists who are dreaming of an independent, religion-based Kashmir state. First of all, they should take note of the internal situation as well as the global image of Pakistan—the rogue state that is conspiring religious violence and separatism in Kashmir. Pakistan was partitioned in the name of religion in 1947. Bangladesh was carved out of it in 1971. Apart from this, Pakistan's internal conflicts are well known to the world. Are people talking of "freedom" of Kashmir, unaware of near daily murders and suicide attacks in the "Islamic Republic of Pakistan?" It is neither a necessity nor a compulsion for Indians and the Indian government to bother about Pakistan's view on the Kashmir issue. In India, all are of the view that Kashmir is an integral part of India and should remain so. And separatists should also understand that it is in the interest of Kashmiris and Kashmiriyat too to remain with India. Barring a few jingoist forces, most political parties are of the view that Article 370, which gives certain special rights to the state of Kashmir, should stayenq and Kashmiri people should be given special rights. Even a complete autonomy bill has also been passed in Kashmir in 2000. According to reports, the interlocutors appointed by the central government will now inquire into the reasons why that bill was not ratified. By this, the government is trying to convince the Kashmiri people to turn to the government for their developmental needs and not become a puppet in the hands of separatists. Some separatists claim that after "freedom" from India, Kashmir will become the favorite tourist destination of the world. This logic seems meaningless if we look at the state of tourism in Pakistan-occupied Kashmir, which Pakistan denotes as "Azaad Kashmir." With Kashmir—where a common Kashmiri doesn't feel safe and about which the world knows that number of terrorist training camps are operating, where rallies and processions by militants are common sight—thinking about foreign tourists arriving there is a joke. The issue of Kashmir can't be settled by freedom. Therefore, it is in the interest of Kashmiris and Kashmiriyat that it continues symbolizing the forehead of the world's largest democracy, of which Kashmiris and India can be proud of.